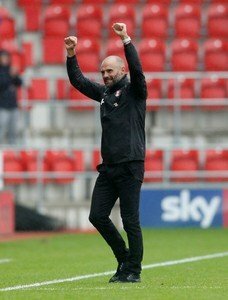 Rotherham United Manager Paul Warne says that it was the ‘fighting spirit’ in his team that got the Millers a point after going two behind yesterday at the Bet365 Stadium. Stoke went ahead after twenty-seven minutes with, what was arguably, their first attack on the afternoon scoring a second just two minutes which seemed to stun the Millers who had had most of the ball for the first twenty-five minutes of the game. It was disappointing to go in two down with many of the eight hundred travelling support, I am sure, fearing the worst for the second forty-five minutes and, although City started the better in that second half, the Millers took charge and scored just before the hour mark followed by a first goal for his club by substitute Matt Crooks. The subs definitely paid off. To be fair a few of us questioned it when Richie Towell was taken off although I, for one, was pleased to see Matt Crooks on and then when Jon Taylor and Anthony Forde were replaced by Ryan Williams and Joe Newell we all thought ‘well, that’s just like for like’. But what a difference Crooks made. He was here, there, everywhere and could well have added to his goal by two or even three more if it wasn’t for Man of the Match goalkeeper Jack Butland. Jones also pointed out that our second goal was offside and he could well be right but, to be honest, that linesman didn’t get a thing right all game – and weren’t we travelling Millers pleased when it looks like he got that wrong too?! We are fighting for our lives in the Championship. We’ve got to keep doing that, it’s all we can do. Of course, it matters what the two teams do above us, but our main object must be to get points from all the games left and hope, crossing fingers, touching black cats, praying, doing lucky rituals etc etc that one of those teams above us slips up. Let’s take this fighting spirit into our next game which is away at Swansea on Good Friday.